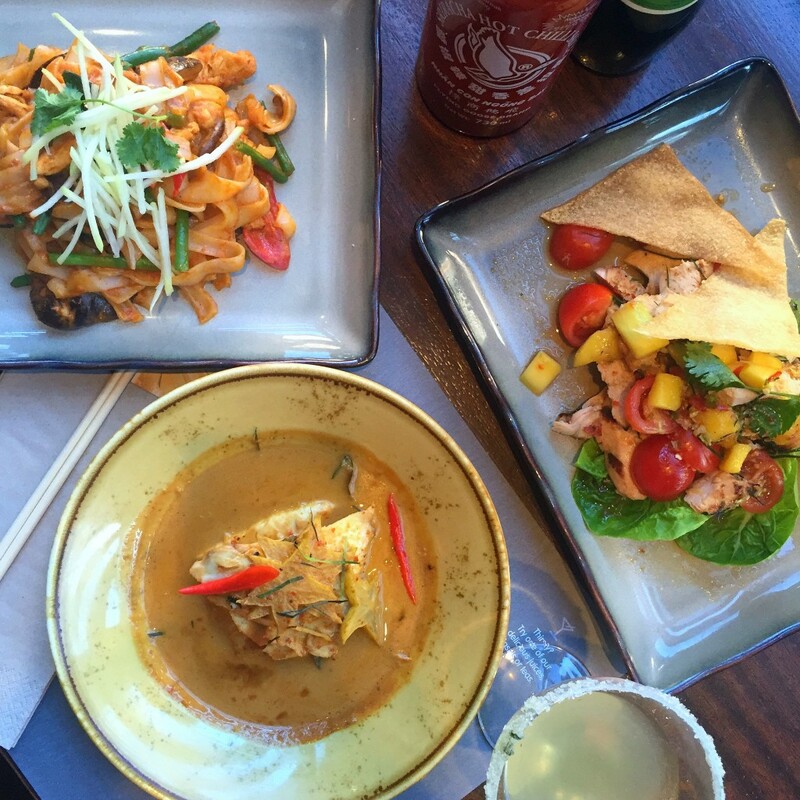 Busaba Eathai have launched their summer menu and boy do they know how to do refreshing and punchy flavours. Having been to Bangkok in their ‘cool’ season earlier this year, and still sweltering in the heat, I can imagine how hot the summers are. So no wander they know what they’re doing when it comes to refreshment. Vibrant flavours, crunchy textures and light dishes are king. The different flavours on the new menu at Busaba combine to create a perfect meal for a hot summers evening. Oh and just you wait until you see the cocktail list! 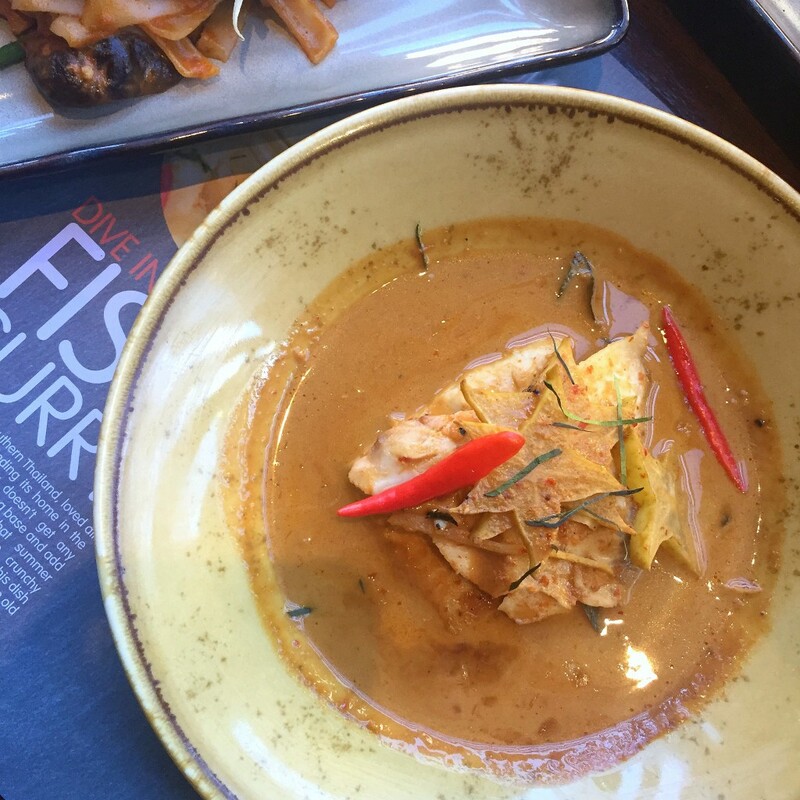 Busaba Eathai is a modern Thai restaurant with 12 locations in London now. Large communal seating fills the space with dark wood and low lighting, it’s actually a great place for a date night. It always smells amazing too – I don’t know what incense they have burning but its lovely. On arrival we were greeted with a cocktail. I went for a very pretty looking Hibiscus Silk (hibiscus infused vodka, honey, lemon, bergamot, ginger syrup shaken with Prosecco) and Katy opted for a Thai Martini (gin, basil, grape juice, lemongrass and elderflower cordial, served in a basil-sugar rimmed glass). 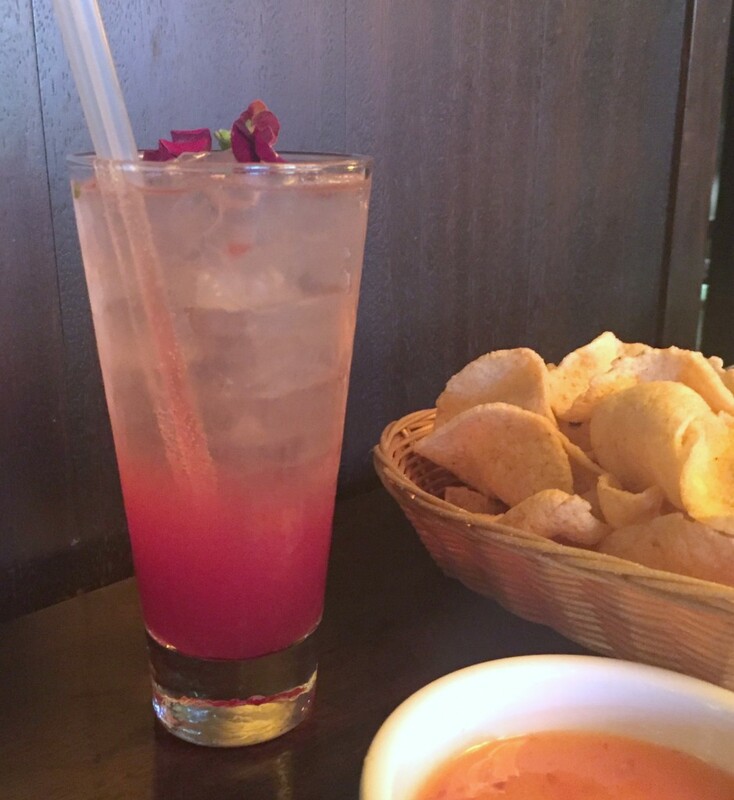 There are two wonderful things about Busaba Eathai, one is their Thai Calamari (order a portion per person, you will not want to share), the second is their delicious and generally very fruity cocktails. So remember, one calamari, one cocktail. I knew before I went to Thailand I would love the country, but I never imagined how much I would fall in love with the food. I don’t think I could pick one cuisine but I could pick two: Italian and Thai. How different are they! But I just love the flavours and variety in both. 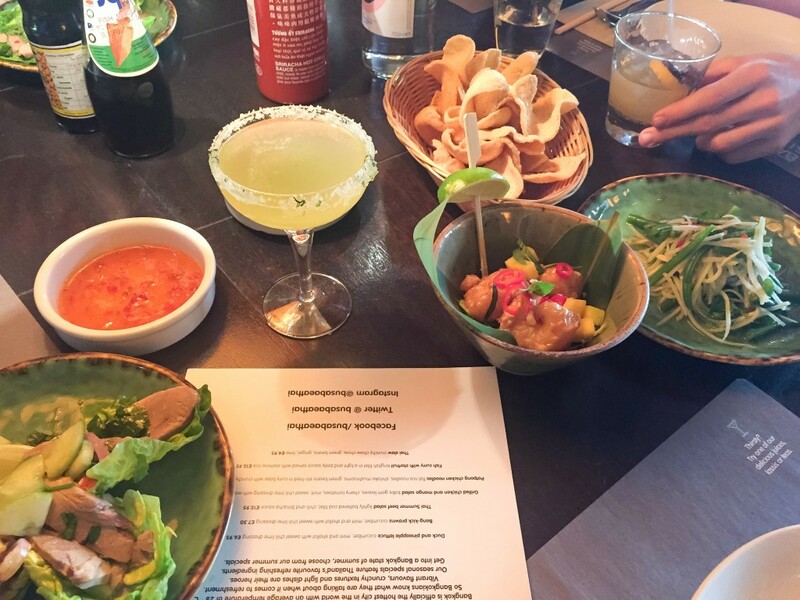 So, you can imagine how excited I was to try the new Summer menu at Busaba Eathai. First to come out were the small plates and a real array of flavours and textures. The duck and pineapple lettuce wraps served with a chilli lime dressing were good, anything with pineapple (except on pizza, yuk) is good in my books. But, it was nothing compared to the Bang-kick prawns and the Thai slaw. These were banging. Katy and I managed to devour over a portion each of the juicy prawns because some gods were clearly looking down on us and positioned them perfectly. The batter was light but just crisp, and coated in what tasted a bit like mayo, but it was beautiful and subtle. Again, chopped pineapple and fresh chilli. 100% yes. I remember the green papaya salads of our trip, who wouldn’t remember the blow your head off spice, sweet and salty heavenly salad. 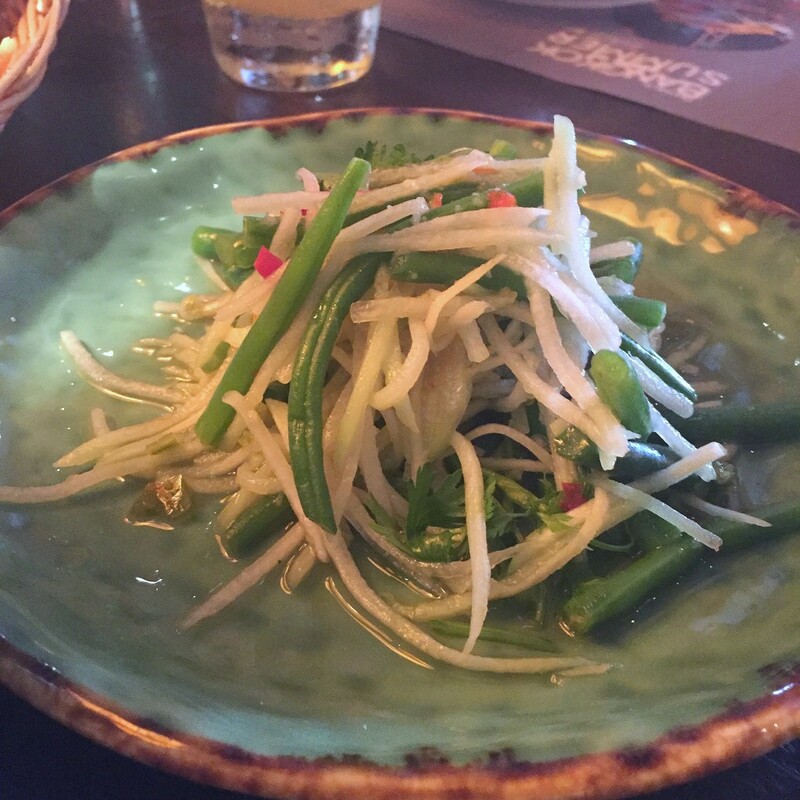 The new Thai slaw at Busaba took me right back to the food markets of Thailand. A happy place indeed. It definitely had a kick and I loved the crunchy green beans. It was very popular with us all and disappeared very quickly! Next the a feast of large dishes arrived at the table. But luckily for us the Summer menu if full of refreshing and light dishes so it means you can easily try a bit of everything. Never a bad thing! For a lighter meal there are two different salads on offer. I’m not usually a huge fan of Asian-style cold salads, I’m not really sure why. I think I just prefer the flavours in warm dishes. 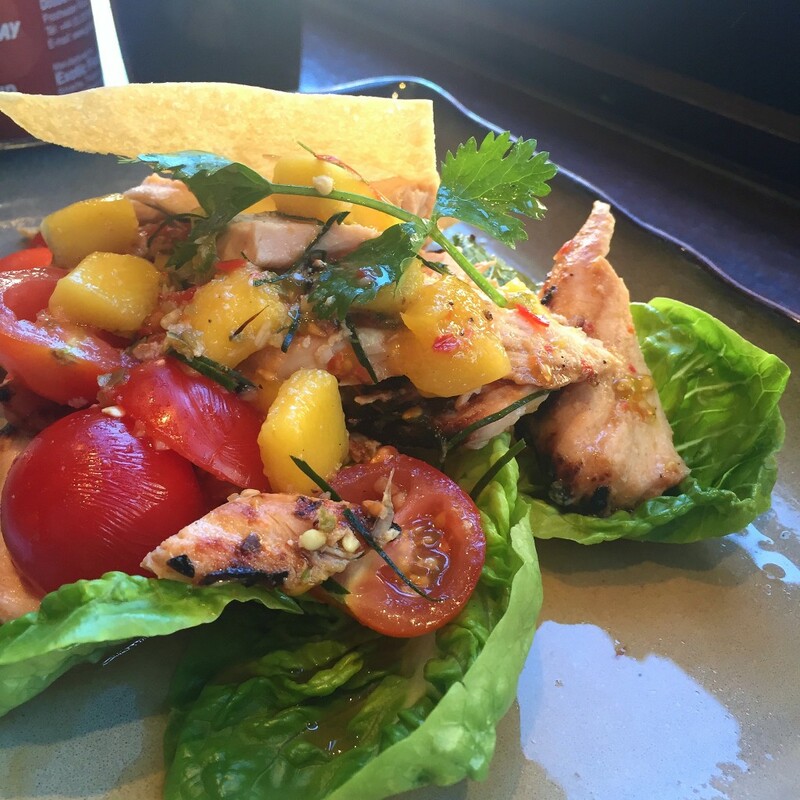 And I think I would still agree with that for the grilled chicken and mango salad. 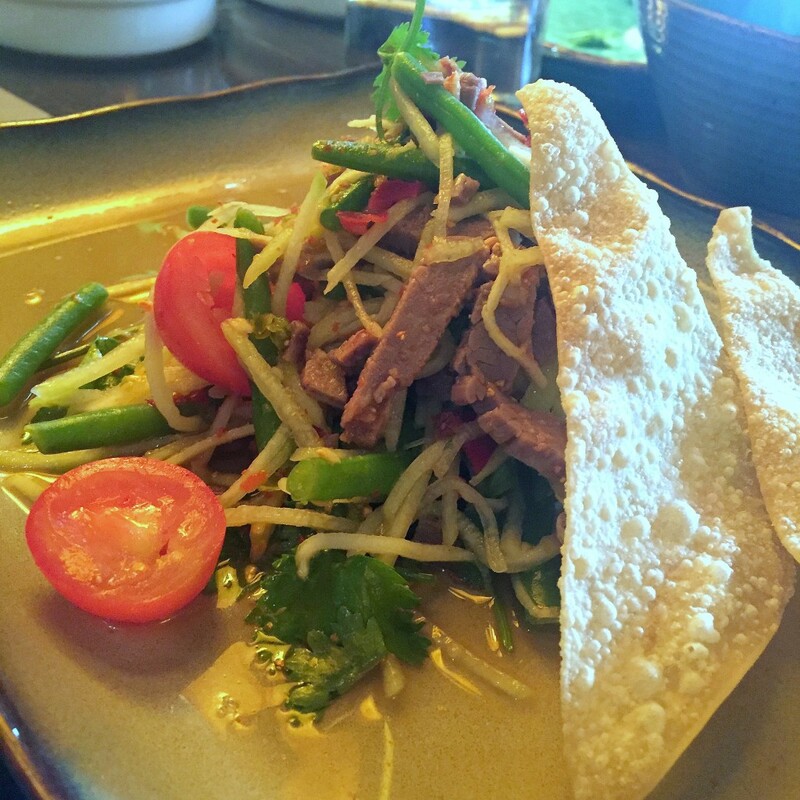 However, the Thai Summer beef salad at Busaba Eathai has totally changed my opinion. I think I remember our chef for the evening, Jude Krit Sangsida, tell us that this beef is cooked for 24 hours. It was so tender and served on a similar crunchy salad to the Thai Slaw. Again bringing different flavours and textures to the dish, so it was a definite winner for me and a great summer dish. 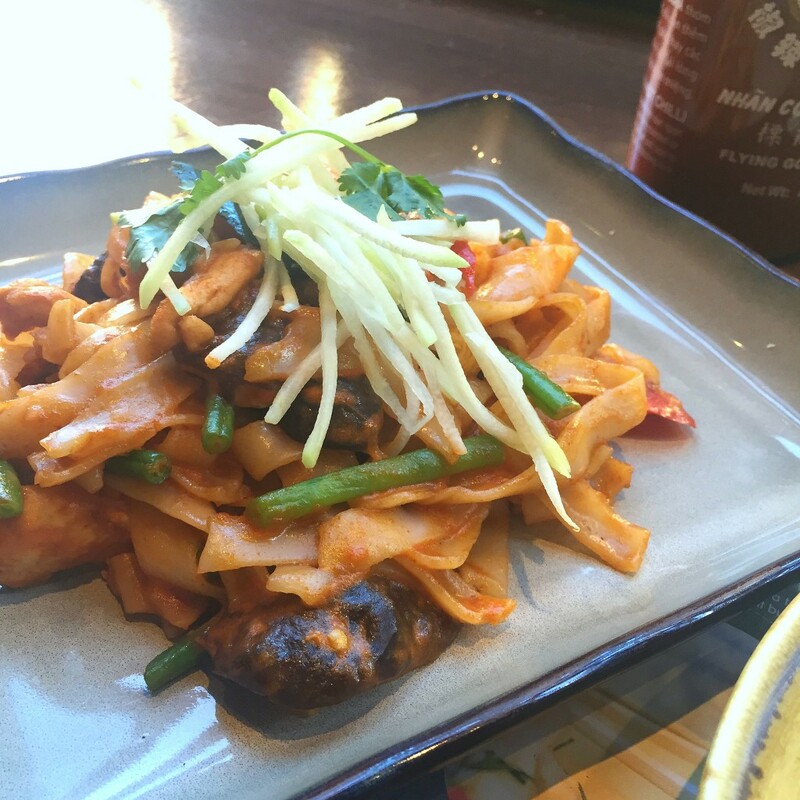 The Patpong chicken noodles are not for the faint hearted! They are spice-ee. But it was a gradual slow burn, so it still meant it was tasty. They kept the mushroom pieces quite large which I like because it keeps them nice and juicy when stir-fried like this. The fish curry with starfruit was a highlight dish of the evening for me. The kingfish is served with starfruit in a light and zesty sauce with warm and aromatic spices. Just utterly delicious. Before the night was over, Ali Monteiro showed us how to shake up our own perfect Thai Martini’s! This was great fun and I now have a new love for these fragrant beauties. 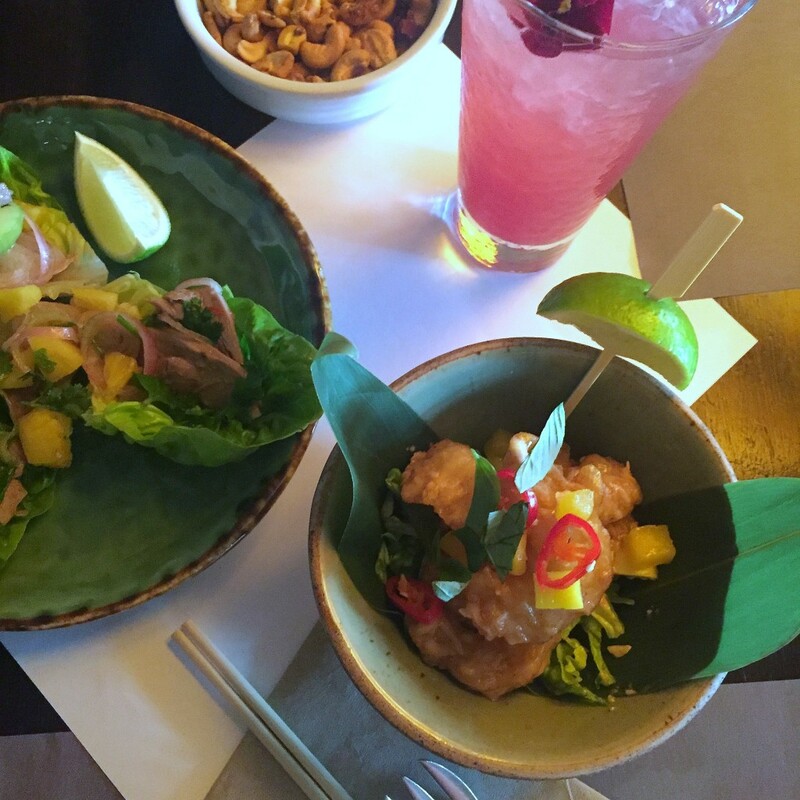 The new Summer menu from Busaba Eathai is everything that it should be. The dishes are vibrant, full of flavour but still manage to be fresh and light. As I mentioned I was especially impressed with the Thai Slaw and Thai Summer Beef Salad. But don’t forget the beautiful cocktails on offer, and always order the calamari off the main menu! That’s an order. Have you tried Thai food before? What’s your favourite Thai dish? Oh, and if you don’t like the Thai calamari from Busaba Eathai I don’t think we can be friends. *I was Katy’s date and invited to try the new summer menu, but all views remain my own. And I will fight you for the last piece of calamari, that’s no lie. I’m also a slow convert to Thai salads, especially in the summer … this beef version sounds great! It was so tasty, Aaron! I couldn’t get over how tender the beef was. I am loving the calamari and cocktail rule! The additional of starfruit in a curry is a new one on me… I’ve only ever had it fresh and wouldn’t even think of putting it into a cooked dish but I’m intrigued! It was really good in the curry! It’s a rule I live by, ha!